What makes for a good scouting. Most of the time, the pre production aspect of a project is the most important one. It is the moment all the different aspect of the photo shoot are being organized so the day of the session goes smoothly according to plan. One part of pre production is finding a location where to take the photos, or “scouting”. According to the requirement of the project, you have to find a selection of possible candidate location for the client to choose from. Many times, a scouting will be done from a couple of days to a couple of weeks before the day of the shooting. Remembering how the location was then can be a little tricky. That’s when taking good notes about each location can be a saviour. It can be about logistic (space, electrical outlets, WC, parking, space for catering …) or creative (style, natural light, …). Taking photos of the place is basic but unfortunately this won’t always help you to plan how the natural light will behave throughout the day. That is where the iPhone can be a great tool. 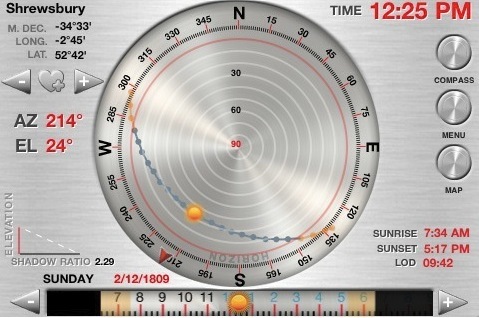 There is an iPhone app called Helios Sun Position. 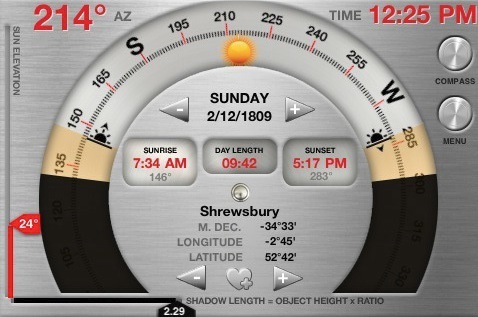 With this little piece of software you can predict the path of the sun from dusk to dawn, on any given day, in any given place. Check it out in the app store. And now photographers are happy again!